Improving your business isn’t always easy. In fact, it’s a lot like dieting. You start with well-researched meal plans that help you avoid junk food, and you find yourself doing pretty well at first. You have more energy, you’re losing weight, and overall, you’re feeling pretty good. Then the inevitable happens. You stop planning out your meals, and junk food finds its way back into your diet. Before you know it, healthy food is no longer a part of your diet. Attempts to improve your business can follow this same pattern: You introduce a great idea that will really improve your business and processes. You communicate the plan to your supervisor, get approval, and then make the change. Fast-forward a few weeks, and you find that things have gone back to the old ways. No matter how good the idea, without a solid process improvement plan in place, the change won’t last. Learn the essential steps involved with every process improvement plan. The definition of process improvement is pretty straightforward. It’s the process of identifying, analyzing, and improving existing business processes. More simply, it’s taking a look at your organization and figuring out how you can do things better. Improve process efficiency and quality. Reduce friction in business processes. Ultimately, process improvement is a way for your business to become the best it can be. Without it, innovation would be almost impossible. If you have an idea to improve a business process, you should act on it. To make sure your idea becomes a reality, you need a process improvement plan that utilizes process improvement methodologies. 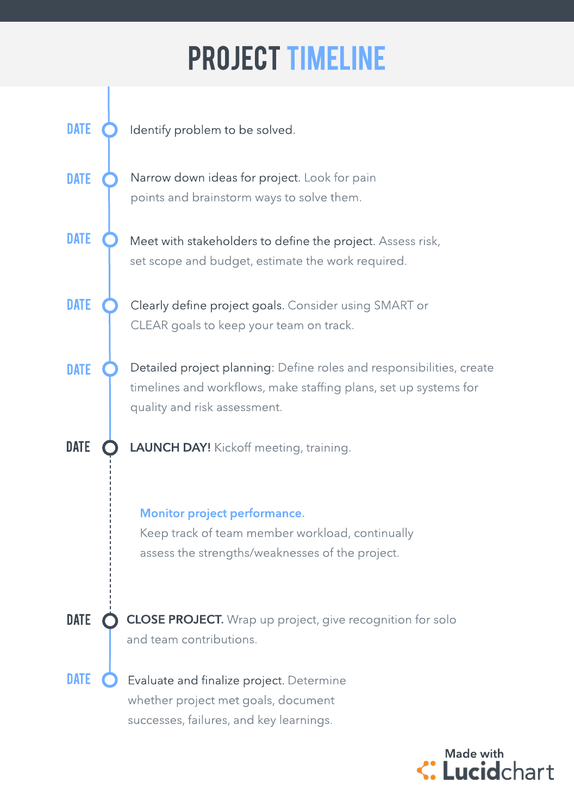 Follow the seven steps below to get started (or see our previous blog post for specific process improvement methodologies). Once you’ve selected a process to improve, visually map out the current steps to see the process as a whole and help you find areas for improvement. 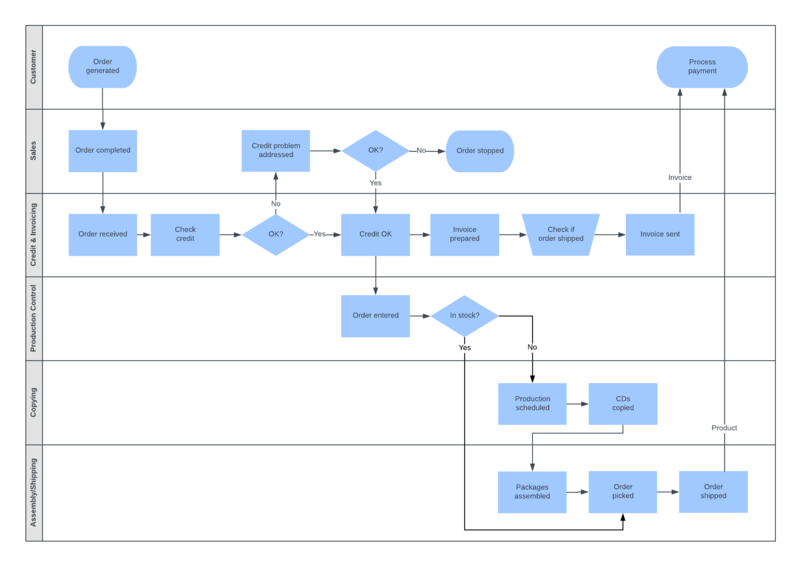 Consider mapping your process using process flowchart templates from Lucidchart. After you’ve mapped out the process, take a closer look at each step. Use the same diagram from the first step to identify where problems occur. Note areas where delays occur, where you use too many resources, or where you spend a lot of money. One of the most important aspects of this step is tracing the problem to its origin. You need to figure out exactly what part of the process causes problems to understand how to fix the problem. For an additional layer of investigation, use the root cause analysis method or Six Sigma process mapping. When you’re finished brainstorming, analyze each idea to determine whether it’s the best solution. Think about how your team would carry out each idea, how long it would take, and what the potential risks are. Who do you need to include to make the change happen? Consider the teams who will be impacted by this change—you might need to talk with managers or colleagues from other departments if you require extra help to get the new processes underway. Once you've figured out who to include, let them know what's going on and what they’ll be working on. Explain the new process and how the change will benefit the organization. The process maps you developed earlier will clarify the process and act as a reference for the team. You can even add swimlanes to delineate roles and responsibilities. With resources assigned and a solution chosen, it’s time to create an implementation plan. Your plan should be as detailed as possible. You’ll want to include the team members you've identified from the previous step in your plan. List the specific tasks that each of your resources will be working on. Then create a timeline that shows when each task will start and finish. Creating a detailed process implementation plan ensures that your plan is carried out to the end. You’re now ready to put your plan into action. Before you move into the execution phase, communicate the plan to your team. Even if you’ve previously discussed the new process, communicate your plan to carry out the work. Keeping your team in the loop reduces the chance your team will resist the new process. After you’ve communicated the new process and plan to your team, it’s time to execute. Follow the plan you created and start making improvements to your process. Process improvement is not a one-time event. It’s a continuous effort. Even after you’ve made improvements to a process, you need to ensure that employees follow the new process by closely monitoring the new process and its results. Should any bottlenecks or problems arise, work with your team to figure out how to get past them. Continuously improving your process ensures that the changes you made to your process last. What process improvement methodology should you use? A process improvement plan is only as effective as the methodologies used to carry it out. The key to choosing a process improvement methodology is recognizing the strength of each method and choosing the one that can help you improve your process. Learn more about process improvement methodologies and decide which is best for your business. In the business world, you should always be looking for better ways to work. By following the steps outlined above, you ensure the enhancements you make to your processes become a permanent part of your company. 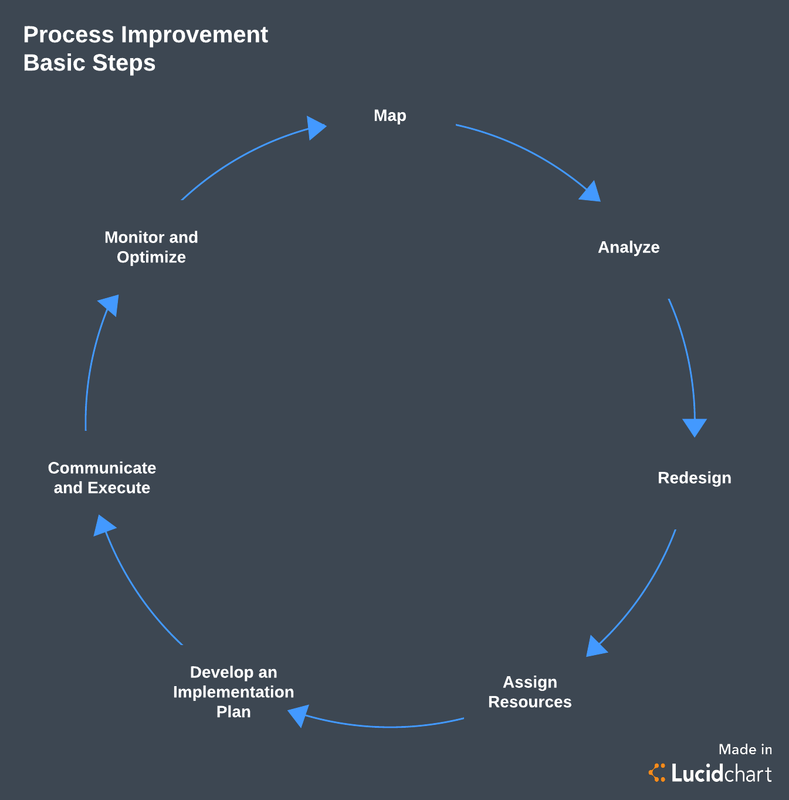 Whatever process you’re looking to improve, Lucidchart can help you create a detailed, organized process improvement plan. Sign up for free today!